So earlier in the week I adopted a little baby girl. A latin cutie named Samira. But if I did I sure hope she'd look like this! My former coworker gave birth last year and brought her bundle of joy to work for all of us to see shortly thereafter. Dark hair everywhere, deep brown eyes, and those chubby cheeks. Just adorable!! Surprisingly, Samira was so well behaved. Very calm and quiet and she would smile a lot. A really wonderful temperament for a baby. A couple months back the same coworker (who takes photography classes) had duplicate photos of her daughter spread along her desk. I asked if I could have one to try and do a portrait. I didn't get around to starting/finishing it until now! Ughh! The challenge was that the photograph was black and white. 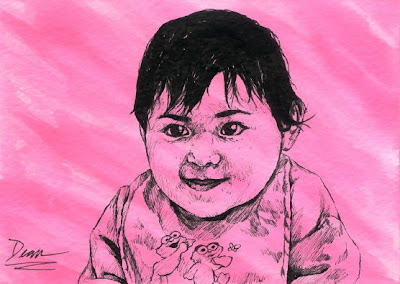 Rather than guess the proper skin tone, exact eye color, etc., I went ahead and did the portrait in black ink with bright pink watercolor washes to keep the background interesting. The last time I asked my former coworker how Samira was doing she told me her daughter put on weight and is becoming extremely grumpy! LOL....I guess they don't stay cute and sweet forever! Clever way of dealing with the black and white photo. I wouldn't have guessed that you didn't have the actual colors available if you hadn't told me. There is just a hint of willfulness in the facial expression on the painting. Well, I have myself convinced that I will stay cute forever, lol! Hope all is well with you, it's nice to see the happy words in your post! Yeah, her facial expression is quite subtle. Just a hint of a smile starting to happen. I love her eyes too. She definitely has that sneaky look to her doesn't she? What a little cutie, Dean. You captured that sweet innocence so well and I love the creative use of b/pink instead of b/w! I just thought pink would match the subject matter and give me an excuse to add some much needed color to the portrait. This is so cute. I love the pink wash. So this was over a year ago, have you done any more? I haven't done anymore baby portraits since. Interesting thing is that the same coworker is currently pregnant with her second child. So if all goes well I'll be doing a portrait of that one too! I admired her big round eyes. And the cheeks she had. You really a talented man managed to portray from a black and white. And still the result is still gorgeous. She was a cute baby!